Every once in a while I get asked why I number each piece of furniture that gets made in my shop. It may surprise some people to find out that it's not an attempt to give my work any special cachet. The numbering system was actually created for very practical reasons. Back in the late 1980s we went through a busy stretch where we found our shop completely innundated with a wide variety of custom furniture work. Because of this my desk was overflowing with all sorts of drawings, finish samples and coils of thermal fax paper containing all types of pertinent information. Looking back I am amazed that we found a way to keep this chaos organized. Although we already had an informal job numbering system in place, it was largely ineffective in a situation where there were 40 or 50 different projects on the go at any one time. (Remember, this was before computerized databases and scheduling software became widely available to small business). Then, one day in the late 1980s I happened to be in New York to meet with a fellow named Mark Logan, who at the time was the general manager for Dakota Jackson's furniture company. I saw on Mark's desk a bin of numbered folders with each folder containing all the pertinent information for each individual job. Mark's system formed the basis for revising our own job tracking system, and from that day forward we assigned each project with a specific number that was used to identify all drawings, samples, faxes and other correspondence related to that particular job. That same number was also used to track timesheets and the hours it took to do each job. In subsequent years this system was easily fine tuned with the introduction of computerization, meaning that we could now organize everything into one massive digital database. Upon completion of each job all samples, drawings, photos, time sheet summaries, color matching formulas and other related information is gathered and sealed in the folder so that it can be stored sequentially in an archives room for future reference. In many cases these archives prove to be an invaluable resource in situations where we have a custom project to make that is similar to something we've already done. In other cases we get asked to make things to match something we've made over 10 years earlier. Having access to these records ends up saving us a great deal of time and effort. Over the years our archives have grown to the point where we now have over 4 decades worth of records, cutlists, cabinet making notes and vintage drawings stored in one large room. 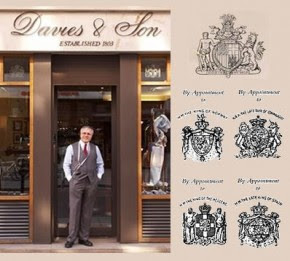 Whenever I am in that room I am reminded of an old shop called Davies and Son, which claims to be the oldest independent tailor in and around Savile Row in London, England. In the early 19th Century it was said that Davies and Son were the quality tailors who dressed all the crowned heads of Europe. They were also the bespoke tailor for Admiral Lord Nelson, who at the time was the most famous sailor of the age based on his service to the Royal Navy, particularly during the Napoleonic Wars. According to legend Davies and Son have managed to keep meticulous records of all their fine tailoring work done over the past 200+ years, and it is said that Admiral Nelson's specific measurements are still on file. 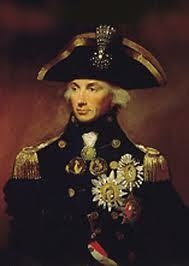 Having said that, if Nelson was alive today he would not only be able to custom order a finely tailored suit from the Davies and Son website via his IPad or Blackberry, but he would also be guaranteed a perfect fit. Labels: Admiral Lord Nelson, bespoke, custom made furniture, Dakota Jackson, Davies and Son, Mark Logan, Savile Row, W.O. 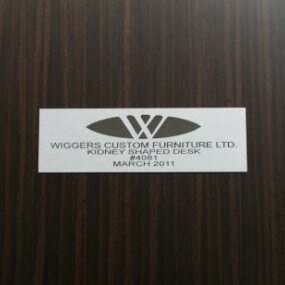 4081, Wiggers Custom Furniture Ltd.